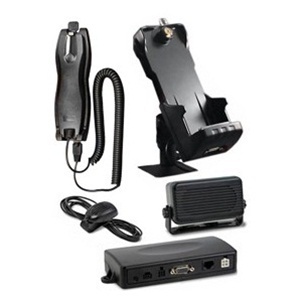 The SatStation Hands Free Iridium Dock provides hands-free voice communication for your Iridium handset. Stay in touch while you are in your car in a building, at sea, or in the air. Equipped with an automatic stereo muting feature and car ignition connection, the SatStation Hands Free Iridium Dock is a ready-to-go vehicular solution. With its cutting edge background noise filter and echo canceling technology, the SatStation Hands Free Iridium Dock offers unmatched quality in satellite communication! Microphone, external for extreme noisy conditions, mounted with sun visor clip.